Media: Soft cover, landscape format, 58 pages plus covers (incl. full colour centre pages). Recommendation: Highly Recommended to historians, ship modellers and anyone with even a passing interest in the subject of WWII maritime events and technology. I have always referred to German torpedo boats as "E-Boats", without knowing exactly what this stood for. I knew why a German submarine was called a "U-Boat", but this title gave me my first insight that "E-Boat" was Royal Navy terminology, and was an abbreviation for "Enemy Boat". The correct term is S-Boat, or S-Boot, which is the German abbreviation for Schnellboot. This translates to Fast Boat. It is logical that Squadron should finally get around to this subject, especially considering they have already covered PTs and MTBs in action earlier in this series. This latest book in the warships series is presented in the familiar "in action" format, with 56 pages plus covers, and six large colour profiles on the centre pages. Three Don Greer paintings adorn the front and rear covers. 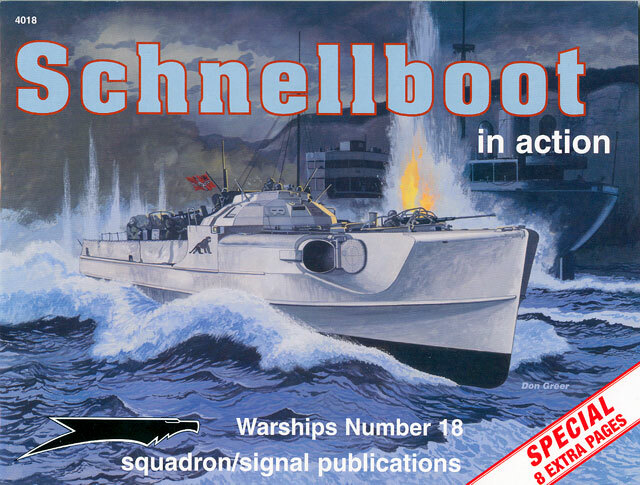 "Schnellboot in action" is packed with 111 excellent and relevant black and white photos. These are helpfully captioned and reproduced large enough for detail to be visible where appropriate. Each class of S-Boot is covered, from S-1 to the first of the S-100 class. There are line drawings of each class to assist in identifying variants, and scrap views illustrating detail and developments. Subjects such as engines, main and secondary armaments, construction, radio, radar and last but certainly not least, camouflage colours and markings. Other interesting aspects touched upon include the armoured dome bridges fitted to late S-38 class boats and standard fit on the S-100. Light S-Boots as issued to Commerce Raiders Komet, Kormoran and Michel are also described and illustrated. This book reaches a very high standard for reference in such a concise format, and can be heartily recommended to all.